If you are fortunate enough to have a cat in your life, you already realize how much love they can bring to the table. There is nothing quite like sitting in a chair, relaxing in front of the TV and petting the cat that is purring away on your lap. It’s one of those things in life that we not only appreciate, we couldn’t imagine living without it. Although you may have a cat in your life that is precious, would you think about treating a wildcat in the same way? Most of us enjoy watching them in movies or on TV or perhaps we may sometimes get out to see them at the local zoo. When it comes to walking up to a wildcat and scratching it behind the ears, however, we might not be so quick to do it. 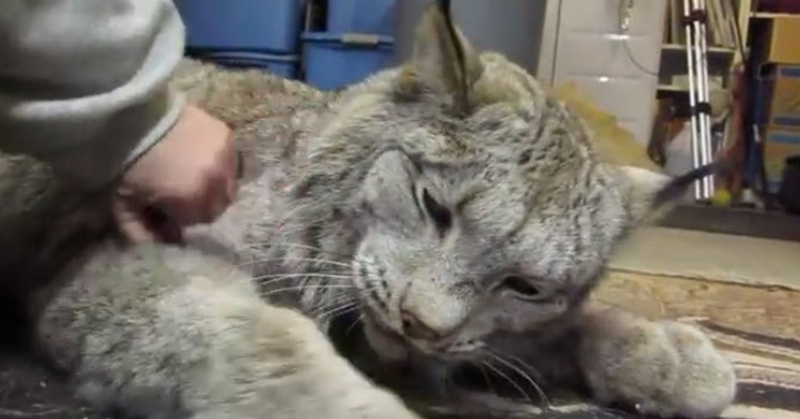 The thing is, that is what this woman did to a Lynx cat that was recently rescued. This woman has become quite attached to the Lynx and apparently, the feeling is mutual. 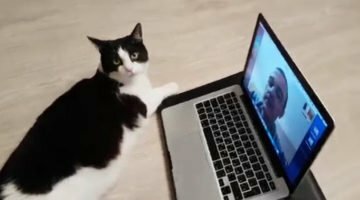 When she walks into the room and begins petting him, he starts responding almost immediately. The sounds that he makes are some of the sweetest you will ever hear in your life and we can’t even imagine what it is like to hear this as a response to your touch every single day.